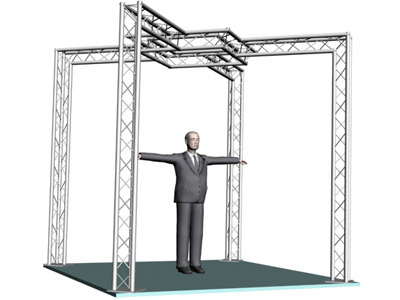 Exhibit and trade show 10 x 10 display truss system designs can be used for structure and decorative accessories. 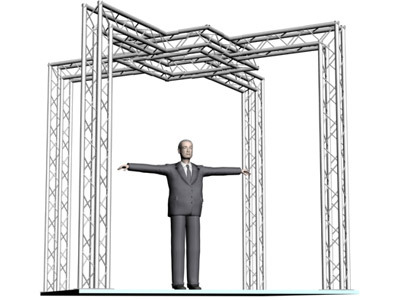 We offer a broad variety of truss designs and sizes as well as custom truss systems that are fast and easy to set up. Our truss designs are available as flat, triangular, or square in terms of its chords. You can also choose from different truss profile sizes depending on the size and stability needed for your truss system. 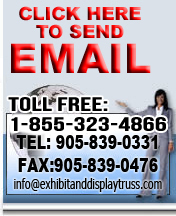 This unique trade show booth design offers a centerpiece which is perfect for hanging banners or signs off of your display booth. Worry no more - exhibit and display truss specializes in creating aluminum truss frames specifically for convention and expo booths. We know you have better things to concentrate on than creating a sturdy base for your booth. Simply contact us with your specifications and we'll build a frame tailor made for your kiosk and your requirements. This 3 chord 10 x 10 unique trade show booth design offers a centerpiece which is perfect for hanging banners or signs off of your display booth. We can fabricate a frame for any budget and any need, whether your focus is more the look of your booth or if you are more concerned with load-bearing. Whether you're simply covering the base with your information or if you need to hang various displays and information, we can create the perfect frame for your trade show exhibit.